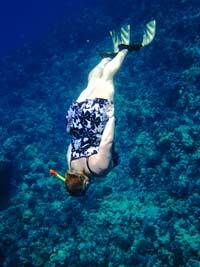 We have most everything you need; mask, fins, snorkels, lunch and drinks. Of course, bring your personal gear: your sunscreen, hats, sunglasses, bathing suits. We facilitate snorkeling instruction for the beginner to the seasoned refining breathing and swimming techniques for optimum dolphin interaction. We have pod leaders for every 6 people providing water support. We offer dolphin education, knowledge and fun facts. To open the Dolphin/Spirit connection we will facilitate opening these spiritual channels for communications and transmissions. We will be leaping for joy just like our dolphin families. Everything you need is provided for this evening encounter; wetsuits mask fins snorkels. We’ll have dinner and drinks, and trained pod leader crew for every 6 people in the water. We will be sharing all we know about the Manta Ray here in Kona. We will witness the beautiful ballet of these magnificent nearly endangered animals. (nature providing as these are free swimming wild animals). This is an awe inspiring out of this world experience. We’ll be learning on site the geology and mythology of the volcano, hiking in Volcano National Park to Kilauea Caldera. We’ll walk over the recent lava to see an evening of flowing lava as Pele indulges us! We’ll stay over night near the Volcano so no long drive home. We will participate in a transformational meditation event in a Lava tube- ‘Manifestation & Creation’. 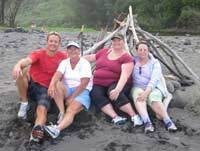 We feature Martin’s beach play and workout day in the white sand and surf at popular ‘always sunny’ Hapuna Beach. After we’ll be hiking the jaw dropping surreal green sea cliffs and pounding surf from the Pololu Valley Lookout to the black sand and driftwood beach below through Ironwood forest and heliotropes. We’ll be wowed and awe inspired as we explore the valley and feel the mana of this wild place. After hiking back out we’ll travel along the magnificent Kohala Mountain to the town of Waimea and head back for our Manta ray evening. Day of Choice Could be Waterfalls, Volcano or just a day to Rest and Relax. 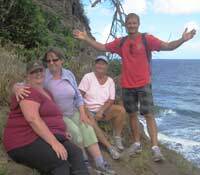 We will witness the dramatic Hamakua Coast, through ocean and lush mountain landscapes. Then walk to Akaka Falls, a 442 foot tall waterfall that plunges down into a deep gorge and inhale the oxygen rich atmosphere of this tropical rain forest.